some of the pilgrimage group with workers from Olive Aid – a charity devoted to re-planting olive groves for farmers who have been affected by the conflict. 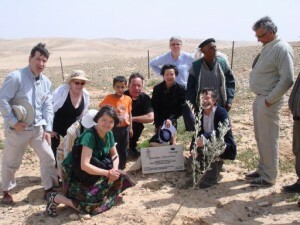 I was privileged to go with a group of pilgrims in March 2013. 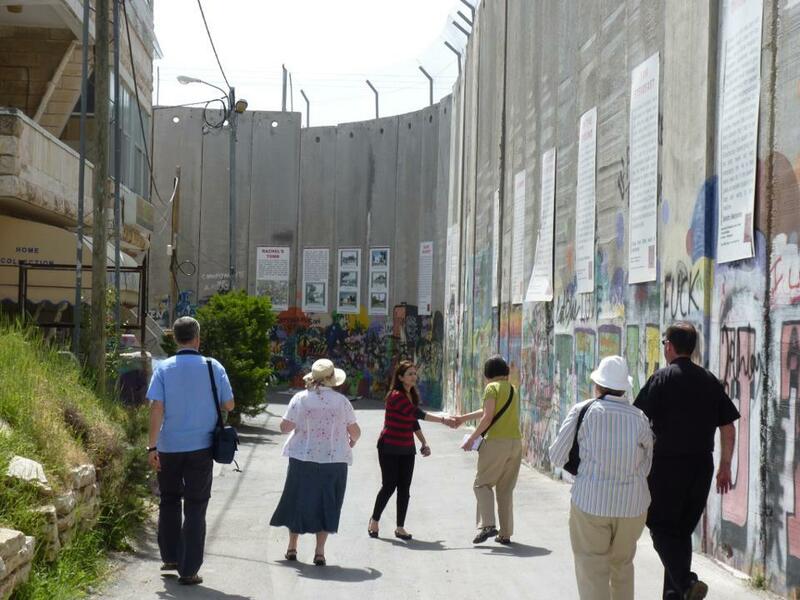 We wanted to understand the situation of the Palestinians in the West Bank. We did this by visiting organisations, villages, church groups and talking to people whose daily lives are blighted by the restrictions imposed on them and the humiliations and injustices they suffer. In Jerusalem we followed the Via Dolorosa, the Way of the Cross, carrying in our hearts not just Jesus’ Crucifixion but that of the farmers who cannot tend their olive groves because of the wall, (the 8 metre barrier) that prevents them from gaining access; the herders who cannot take their sheep and goats to graze; the villages cut off from their water supply; men and women who cannot get to their places of employment without harassment. 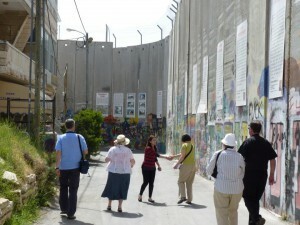 We stayed in Bethlehem which is practically enclosed by the wall. Here unemployment is high, and poverty is deepening. Rising fees and growing economic hardship threaten the possibility of higher Education for Palestinians. People needing hospital treatment can be held up for hours for no reason other than a display of power by young soldiers. This has lead to tragic results – even death. 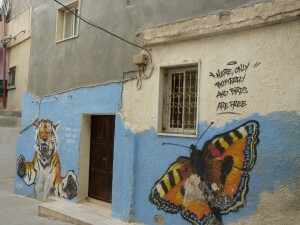 Another place we visited was the Aida Refugee Camp. It had been raided the night before our visit: 6 men had been taken away- no reason had been given. We were puzzled when their families hoped they would be charged. However, this was because, after two weeks, they would know where they were and how long they would be detained. Some people are held in “administrative custody” indefinitely without charge. We could only imagine how terrifying it must be when scores of soldiers pour out of armoured vehicles, armed to the teeth and enter houses. Children and youths are often taken away for offences such as throwing stones at the watch towers- not that they can hurt the soldiers. Often they are interviewed by the military without having a known adult with them. Live ammunition is often used against them…. When incidents occur whole villages or areas suffer “closures” and curfews even though “collective punishment” is illegal under the Geneva Convention. In East Jerusalem Palestinians suffer house demolition, evictions and land seizures due to the illegal Jewish settlements. With Mirwan from the Holy Land Trust, which trains villagers in non-violence, we met a woman whose house had been demolished twice and rebuilt with their help. Like so many others she just wanted to live in peace with her neighbours, in security with her rights and those of her community respected . Palestinians and Israelis are in fear of each other, exacerbated by a lack of real contact with each other. As Christians we looked for the signs of hope in this dire situation: the courage of Israelis who stand up for the Palestinian cause even though this can lead to them being condemned as “self-hating Jews” and consequently discriminated against; the organisations like B’tselem and the Holy Land Trust who train Palestinians in non-violence; the Woman’s Group Shorouq who are in partnership with a group of Israeli women, sharing skills; Sabeel at Bethlehem University; the men and women we met in Nablus who endure their suffering with dignity and look for ways to improve their conditions. It is a desperate situation and we know there cannot be lasting peace without justice. In solidarity we can support the small movements and micro-projects that are seeking to ease the suffering of the Palestinians, tell their story and urge our politicians to support a political process that will lead to peace.